Winter is moving in and it won’t be long before Hallasan is topped with a crown of snow. That doesn’t mean you have to retreat indoors and hibernate until spring, however, as there are still numerous outdoor activities to keep you warm throughout the colder months. 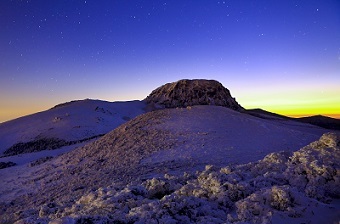 In fact, many tourists visit Jeju in winter specifically to enjoy its seasonal delights such as the snowcapped Hallasan and the winter landscapes. 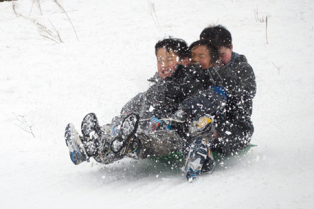 If the cold is a problem, then warm yourself up with the plentiful sledding, horseriding, walking and hiking. There are also fewer tourists about, so you can have more of those solitary moments out in the Jeju countryside. Here are the best options for the wintry months from December to February. 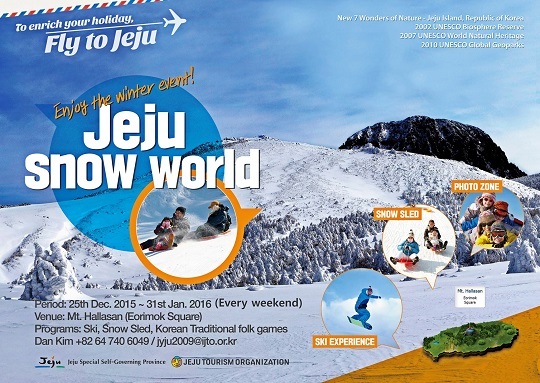 The Jeju Snow World festival runs on weekends from Christmas Day to the end of January and includes a free shuttle bus bringing visitors up from the city. Skiing, sledding, Korean food corner, games, souvenirs and more. There will be a shuttle bus running between the festival site and Jeju City. Check with Jeju Tourism Organization for the route and timetable. For New Year’s Eve only, hikers are allowed to ascend Mt. Hallasan at night to welcome the new year. Around midnight, walkers will be able to ascend the dormant volcano in a unique experience. The Jeju Tourism Organization will also be holding some celebratory events. Whenever the snow is deep enough for safe sledding, the horse pastures on the 516 between Jeju and Seogwipo open for the public and have a great festive atmosphere. 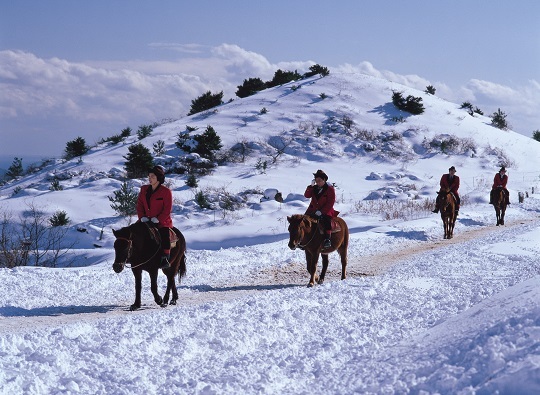 It is not the first thing that comes to mind as a winter activity, but Jeju’s winter landscapes are even more beautiful from the back of a horse. At over 1 million square meters, this is the biggest horse-riding park in Korea. You can also ride the Hallama, Jeju’s native breed. 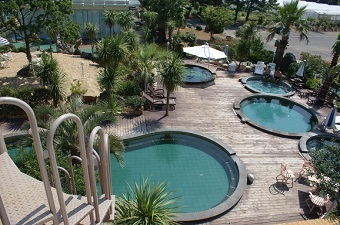 Despite the cold, this is the best time for outdoor bathing and the hot herbal and sea waters relieve your body and mind. Watch the steam rise off the water and your skin as you look out across Jeju’s rural southwest to Dansan and Hyeongjeseom Islets. 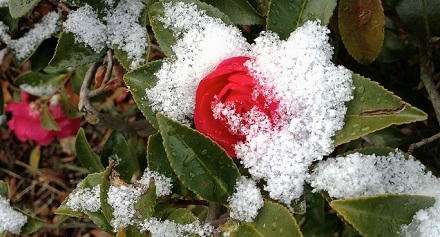 Just as other plants are looking to keep things simple for winter, the camellia is looking to show off all its colors! Throughout winter the flowers can be found across the island, but the Ramsar site of Dongbaekdongsan in the Seonheul Gotjawal is one of the best locations for them. You can also have the pleasure of walking through one of Jeju’s gotjawal volcanic woodlands, where the stable temperature is always a tough warmer than outside. 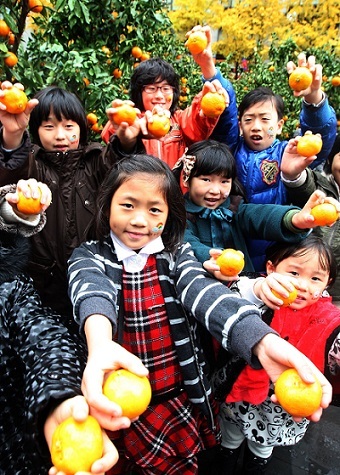 Winter is the mandarin season so brave the cold, don some gloves, and pick some citrus, preferably down south. The Citrus Museum offers great picking and boasts a themed exhibition room, a 3D video, a folklore exhibit and a subtropical garden. The iconic place to see in the first sunrise of the new year is Seongsan Ilchulbong. From Dec 30 to Jan 1, the Seongsan Ilchul Festival will include fireworks, performances, festival foods and drinks to warm your cockles. 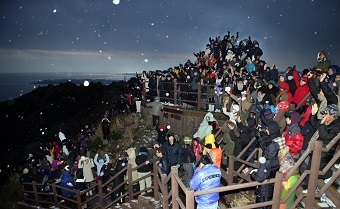 On Jan 1, crowds will ascend the castle-like peak to see in the first sunrise of the year. Dive into the freezing winter waters and brave the cold with plenty of other locals! Other events include traditional wrestling, musical performances, raffles and free winter foods.